Being an actor is hard. It is fraught with rejection, failure, insecurity and envy. 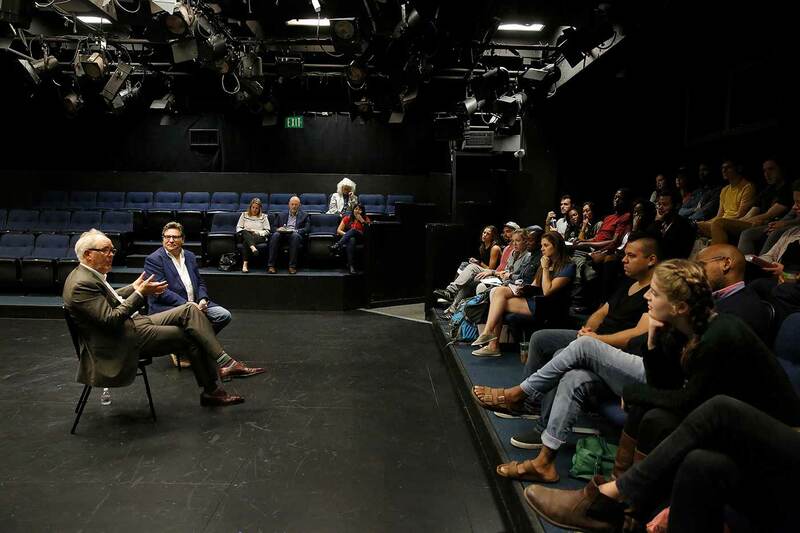 “It is a profession that is very hard on your ego,” he told a small group of UC San Diego master of fine arts in acting students during a visit to the campus last week. Even worse, he said with comic theatricalism, is the “humiliation of being rejected by people you have contempt for,” a well-rehearsed line that garnered laughs from the students. 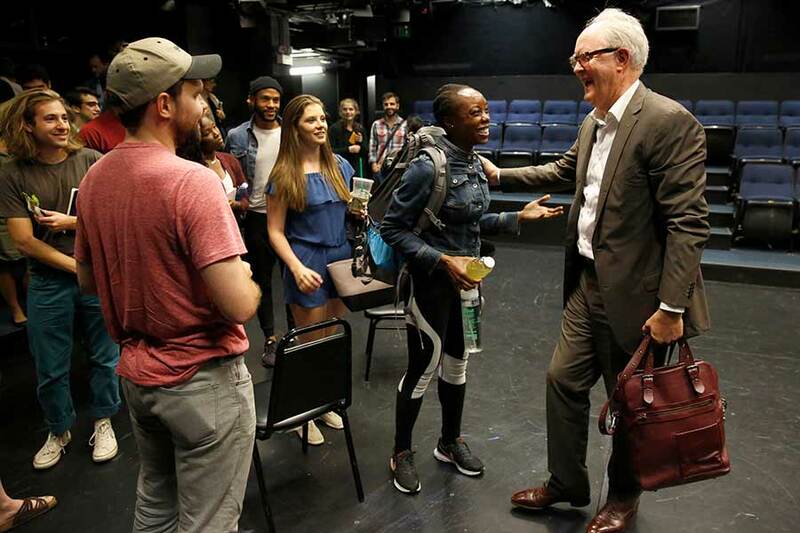 While he is the first to admit he has had an “enviable” career, Lithgow told the students that when young people tell him they want to be actors, he has a simple answer: Don’t. But, he explained, for most his admonishment has no impact because for them acting is a calling. “You should only be an actor if you can’t not be an actor,” he said. Lithgow met with the students as part of his visit to the campus that UC San Diego Extension sponsored through its Helen Edison Lecture series. In the evening, Lithgow regaled an audience of nearly 700 about the ins and outs of his eclectic career in conversation with Peter Gourevitch, founding dean of UC San Diego’s School of Global Policy and Strategy and a distinguished professor emeritus of political science. Gourevitch attended Harvard at the same time as Lithgow. The two men even appeared in Gilbert and Sullivan’s “Trial by Jury” with Gourevitch, who was a graduate student at the time, performing in the chorus and Lithgow serving as one of the leads. 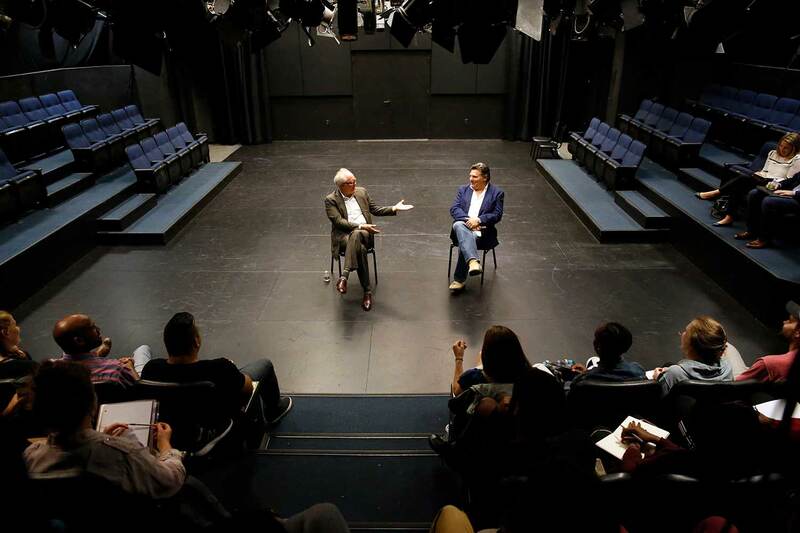 In both his conversation with the students and with Gourevitch, Lithgow was able to provide fresh and unexpected insights into the life of an actor. That should be no surprise as Lithgow has, in fact, spent his entire 72 years of life acting. Growing up in a theater family, he got his start as a small child with bit parts as Mustardseed in “A Midsummer Night’s Dream” or a spear carrier in the many Shakespeare plays his father produced. As he grew up, he graduated to supporting roles such as Hortensio in “Taming of the Shrew.” But, as Lithgow explained, life in the theater was more nomadic than glamorous with his family living in eight different places before he was in high school. “I had a good, strong sense how precarious” the life of an actor was, Lithgow told the students. In fact, he said he had planned to reject the family business and become a painter. Instead, he went off to Harvard and almost immediately fell in with the “theater gang.” After graduation, he received a Fulbright and studied acting in London. When he returned to the United States, however, he spent two years as an out-of-work actor, driving a cab and working at a radio station to help make ends meet. “I couldn’t get any acting job except for with my dad, and I didn’t want to work for my dad,” he explained. Finally, Lithgow landed a role in the play “The Changing Room,” a play about a rugby team. It was a career-changing role. He made his debut on Broadway on March 7, 1973 and won a Tony award for his performance on March 25, 1973, which, Lithgow joked, must be some sort of a record. 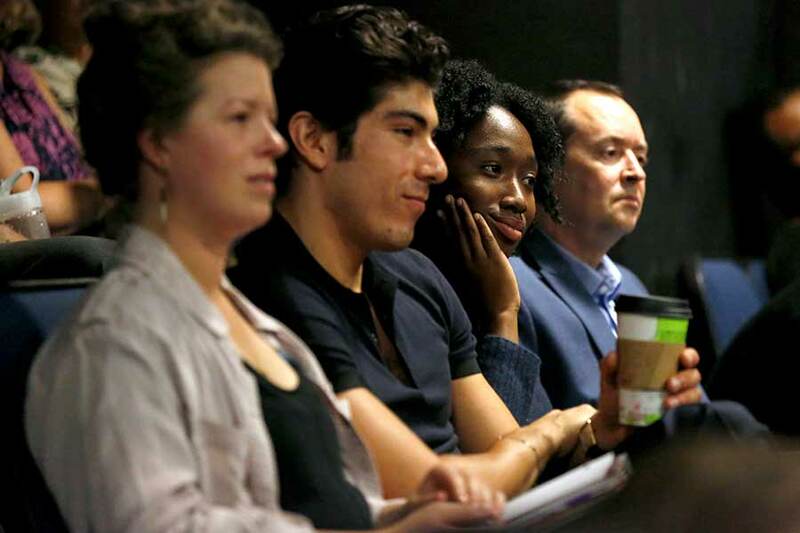 The sheer volume and variety of Lithgow’s work provided the small group of MFA students insights on the craft of acting. As a stage-trained actor, for instance, Lithgow’s transition to movies was not exactly seamless and he said he was racked with insecurity as his theater technique was often a bit much for film directors. Lithgow said as an actor the insecurity never really goes away. With “The Crown,” he said he felt intimidated as he was the only American in the cast—who just happened to be playing Winston Churchill, one of Britain’s most famous citizens of the 20th century. To prepare, he spent six months reading and watching all he could about Churchill. To transform his appearance and his voice, Lithgow experimented with putting cotton up his nose. He even used a melon baller on an apple to help create Churchill’s jowls, even going so far as to bring the melon baller to England for the filming. David Price, a first year MFA student said he valued the insights Lithgow provided. “What I enjoyed the most was that even after all this time is how much he appreciated the craft and all the things that we do as actors,” Price said. Danielle Wineman, a second year MFA student, agreed, saying it was an honor to meet Lithgow. “It was so gratifying to see he is not only a fabulous actor and an incredible artist but also someone who is just a good human. It was an absolute joy to be in that room with him,” Wineman said. For Lithgow, the feeling clearly seemed mutual. It is a profession and a life that is rewarding and worthy—despite all its pitfalls, Lithgow stressed. Still, he had some advice on how to deal with the challenges of an actor’s life. He told the students to take lessons in tap or voice or in anything that interests them and to work on a project of their own making whether it is a movie script, a play or a painting. “Do something you own so you are not just waiting for someone to want you,” Lithgow said.